Through a series of events that scientists themselves admit was “extremely improbable,” a mosquito that feasted on the blood of Eocene animals some 46 million years ago managed to die and become trapped in sediment, but remain in tact, all while carrying a belly full of blood — its last meal. The result, recently discovered in some oil shale from northwestern Montana, is the first fossil of a mosquito found still engorged with ancient blood. The discovery was announced in this week’s issue of the Proceedings of the National Academy of Sciences. Most fossils of blood-eating insects that have been found are of midges, a kind of biting fly, trapped in amber, the team points out. But since mosquitoes typically prefer open habitats near water, rather than forests full of sap-bearing trees, finding preserved remains of mosquitoes has been rare. In addition, the scientists note, not all species of mosquito eat blood, and even in those that do, it’s only the females that partake. Plus, DNA molecules are too complex and fragile to survive fossilization, the team says, so it’s impossible to tell what kind of animal the Montana mosquito took its final meal from. But among the discoveries that this find has made possible is that other large molecules — like those large enough to denote the presence of blood — can still survive fossilization. 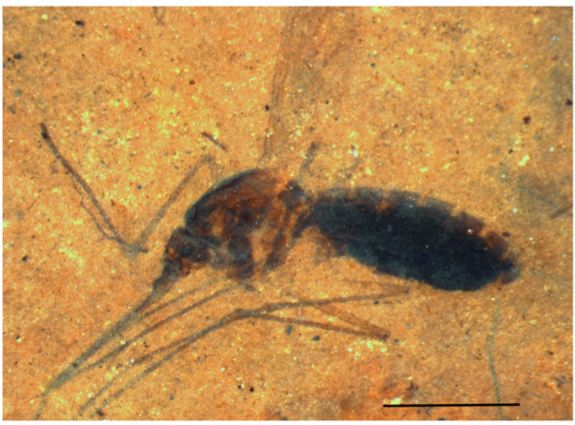 The team decided to investigate the fossil more closely after noticing the insect’s dark, distended abdomen, appearing much like a modern mosquito after drinking a big blood meal. Tests of the abdomen revealed very high levels of iron ions, a mineral in which animal blood is rich. So the team analyzed the sample using mass spectroscopy to get a more precise chemical makeup of the insect’s gut contents. They found telltale organic compounds that are the “fingerprints” of a substance called heme, the molecule that allows hemoglobin in blood to carry oxygen, and that gives blood its red color. The presence of these compounds, they say, is “incontrovertible documentation” of heme, and therefore likely hemoglobin, in the insect. No dinosaurs, no fun! Everyones waiting for the real Jurassic Park. One can only wonder what other amazing fossils remain to be discovered. I have a feeling this is going to be a “science or fiction” question on this weeks skeptics guide to the universe podcast. What a pity we can’t yet be forensic enough to discover from what creature the last meal was taken. And if there is blood, there are heme groups. If there are heme groups, there are carbon atoms as well as iron and oxygen. That means they are supposed to run a C-14 test on it. What do they do if that blood has any C-14 (meaning that mosquito is 100,000 years old or less) in it? Back to the geologic column strata dating board? No way! C-14 is more accurate than any other dating method even though it is only good for a maximum of 100,000 years or so. Spine tingling indeed. I always wondered why mosquitos, allegedly hundreds of millions of years old, never seem to have “evolved” (the fossilized ones are identical to “modern” ones). Remember, the cover up is ALWAYS worse than the crime. Was it possible to tell if the red blood cells were nucleared? will the scientists who study the mosquito take out its blood and bring the Eocene animals back to life? 46 million years and a simple mosquito hasn’t noticeably changed at all…along with thousands of even older and less complex organisms. While man, far more complex, adaptable, (and less tinkerable without severe consequences), supposedly jumped species in an increasing number of forms from some obscure “Eve” from one place in Africa in the space of a few hundred thousand years? There isn’t even the “junk DNA” myth to vaguely insinuate as being indicative of anything since ENCODE in 2013.